Ah, I see it’s postmodern. P.S. I don’t always understand postmodern. Haha… that builds up the suspense, Paul!! You are right!! I didn’t think of the damages. So please hurry up with the sequel, Paul!!! LOL! You’re quite right, Erika, I do need to hurry up and finish this thing. There’s no telling how bad this could get. Why I could be named in a furniture class action suit! From this I learned that corncob pipes were an item at L.L. Bean once upon a time. That is the point of this story, right? Guess I’ll have to come back tomorrow and find out. I imagine a small snow pile in the Sahara Desert could give rise to just about anything. The Sugar Plum fairies are time travelers, Paul, that’s why they appeared from nowhere and Santa is zapping through the sky and the Bedouins can see Toledo from their backyards! “What in the world was in your pumpkin spiced latte?”…..there you do, Paul. “What in the world was in your pumpkin spiced latte?”…..there you go, Paul. I have already contacted my attorney and asked him to look into the possibility of damages to my sofa as a result of your post. He said, “if part two isn’t posted by next Thursday, you might have a case”……just warning you. I think the corncob pipe was on backorder from Gucci. You know how slow designers are. Perhaps they have brought pumpkin spiced lattes for the snowman. Who knows where the story will go if those things are involved. Oh no, no, no. That’s must be the caffeine talking, Sarah. Although, you may be right. 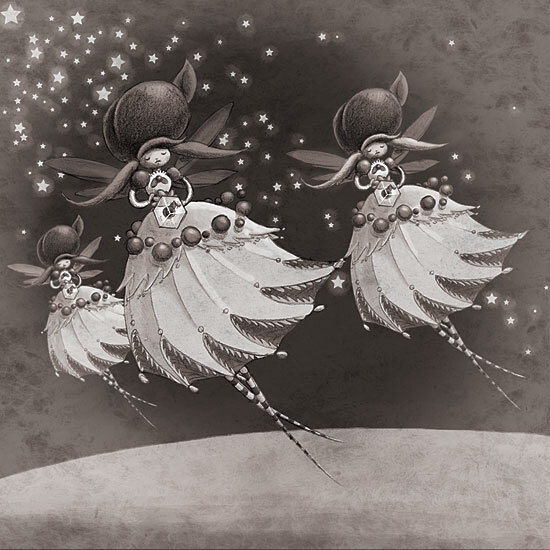 When it comes to deranged Sugarplum Fairies one can never be too sure what to expect next.